This beautiful "Diamond By the Yard" Necklace features 10 round diamonds with a total carat weight of .50ct set in 14k White Gold. Chain length = 16"
This stunning pendant is part of our "Tuxedo Collection" set. Featuring a black diamond drilled at the center and filled with a sparkling white diamond for a total carat weight of 1.00ct. Set in 14k white gold. Diamond Halo Pendant with 17 diamonds around center diamond. Set in 14k White Gold 17 Diamonds = .25ct 1 Center Diamond = .70ct Set in 14k White Gold Total Weight: 3.43 Grams Comes with FREE 16" Chain! This gorgeous solitaire diamond pendant sparkles with a beautiful round diamond with a carat weight of 1.50ct set in 14k yellow gold. Comes with 16" 14k gold chain. 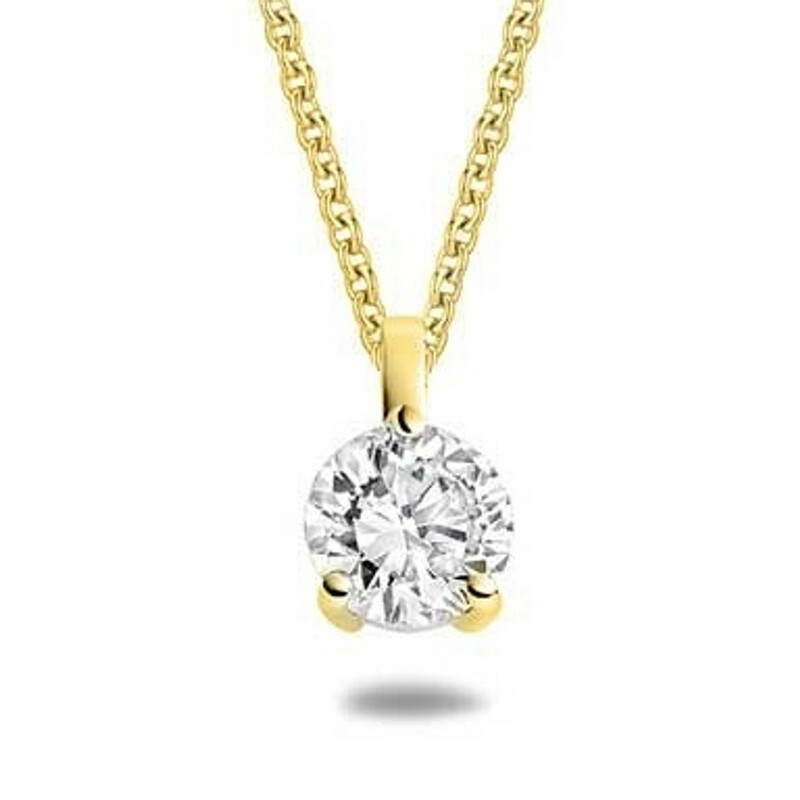 This gorgeous solitaire diamond pendant sparkles with a beautiful round diamond with a carat weight of .50ct set in 14k Yellow Gold. Comes with 16" 14k gold chain. This gorgeous solitaire diamond pendant sparkles with a beautiful round diamond with a carat weight of .33ct set in 14k Yellow Gold. Comes with 16" 14k gold chain. This gorgeous solitaire diamond pendant sparkles with a beautiful round diamond with a carat weight of .25ct set in 14k yellow gold. Comes with free 16" 14k gold chain. This gorgeous solitaire diamond pendant sparkles with a beautiful round diamond with a carat weight of .25ct set in 14k white gold. Comes with free 16" 14k gold chain. This gorgeous solitaire diamond pendant sparkles with a beautiful round diamond with a carat weight of .33ct set in 14k white gold. Comes with free 16" 14k gold chain. This gorgeous solitaire diamond pendant sparkles with a beautiful round diamond with a carat weight of .50ct set in 14k white gold. Comes with free 16" 14k gold chain. This gorgeous solitaire diamond pendant sparkles with a beautiful round diamond with a carat weight of 1.00ct set in 14k white gold. Comes with free 16" 14k gold chain. This gorgeous solitaire diamond pendant sparkles with a beautiful round diamond with a carat weight of 1.50ct set in 14k white gold. Comes with free 16" 14k gold chain. This gorgeous solitaire diamond pendant sparkles with a beautiful round diamond with a carat weight of 2.00ct set in 14k white gold. Comes with free 16" 14k gold chain. This stunning diamond necklace features one(1) 10x5mm Marquise Diamond(1.00ct) surrounded by 27 sparkling white diamonds(.20ct t.w). Set in 14k White Gold. This stunning Diamond Halo Pendant features One(1) 1/2ct round diamond surrounded with 34 sparkling white diamonds (.27ct t.w). Set in 14k White Gold. Comes with 16" 14k Chain.